'Blade Runner' Pistorius In Tears As Murder Charge Is Filed : The Two-Way Authorities in South Africa intend to purse a case of premeditated murder against the Paralympic and Olympic sprinter. He's accused of killing his girlfriend on Thursday. The athlete's agent says Pistorius disputes the charge "in the strongest possible terms." 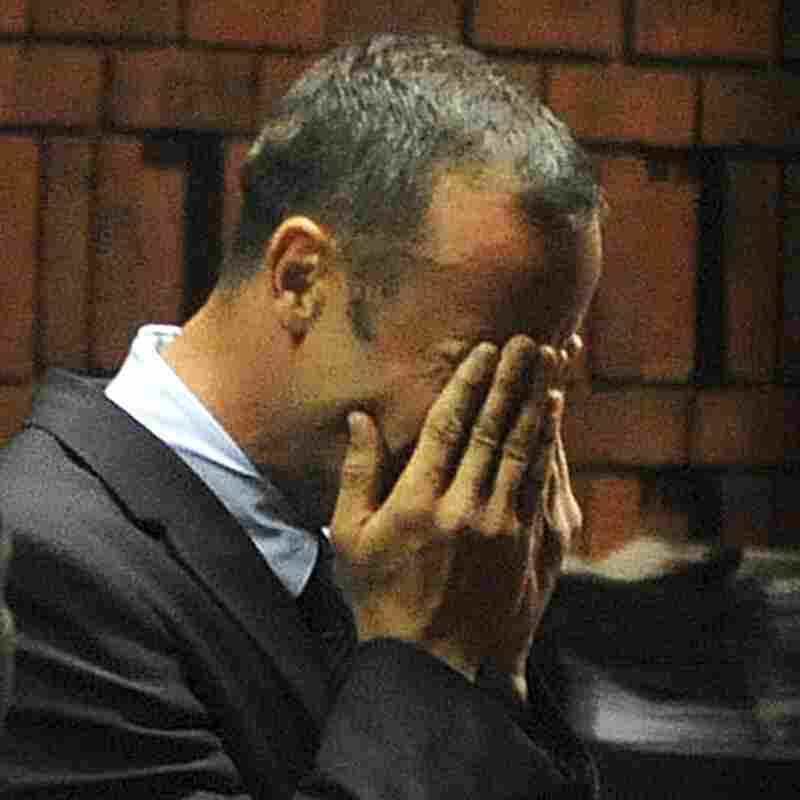 South African Paralympic and Olympic sprinter Oscar Pistorius as he wept today while being charged with murder. "South African 'Blade Runner' Oscar Pistorius broke down in tears on Friday after he was charged in court with shooting dead his girlfriend in his Pretoria house," Reuters reports from Pretoria. According to the wire service: "The 26-year-old Olympic and Paralympic superstar stood with head bowed in front of magistrate Desmond Nair to hear the murder charge read out, then started sobbing, covering his face with his hands." South Africa's News 24 reports that a "teary-eyed" Pistorius, "with jaws clenched ... heard the state intended pursuing a case of premeditated murder against him." When the hearing ended, writes the Los Angeles Times, "Pistorius was remanded in custody at Brooklyn police station in Pretoria until Tuesday when his bail application will be heard. Under South African law, an accused person charged with such a high-level offense would have to prove exceptional circumstances to be granted bail." Pistorius' agent, Reuters adds, says the sprinter disputes the murder charge "in the strongest possible terms." As we reported, police were called to Pistorius' home on Thursday. There, 29-year-old Reeva Steenkamp had been shot four times. According to NPR's Gregory Warner, authorities say it looks like she was shot "through a bathroom door." Pistorius is a double amputee whose athletic accomplishments have inspired people around the world. He was born without fibula bones below his knees, and his parents chose to have his legs amputated below the knees when he was an infant. He's known as the "blade runner" because of the carbon-fiber prosthetic legs he uses. Last summer in London, he became the first double amputee to participate in an Olympics. Update at 9:30 a.m. ET. Statement From His Family And Management Company. "Firstly, and most importantly, all our thoughts today must be with the family and friends of Reeva Steenkamp. "Oscar Pistorius has made history as an Olympic and Paralympic sportsman and has been an inspiration to others the world over. "He has made it very clear that he would like to send his deepest sympathies to the family of Reeva. He would also like to express his thanks through us today for all the messages of support he has received — but as stated our thoughts and prayers today should be for Reeva and her family — regardless of the circumstances of this terrible, terrible tragedy.